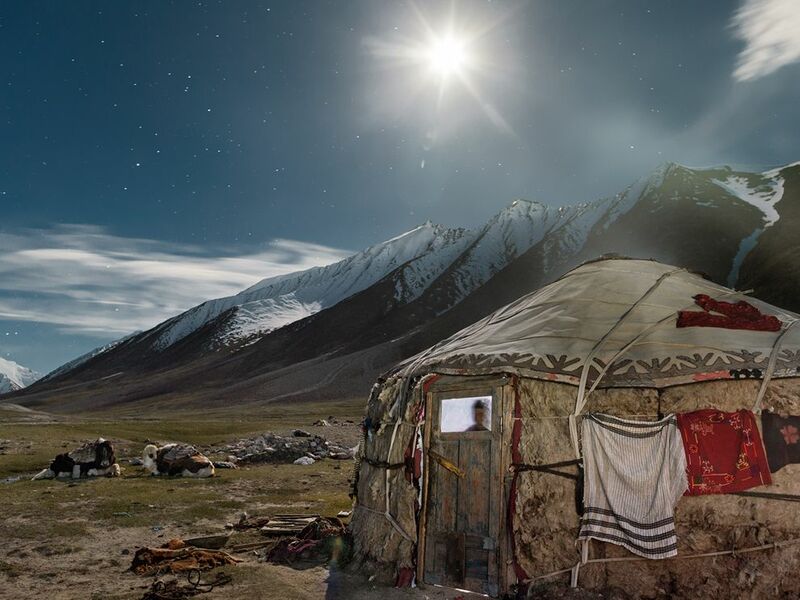 May 3, 2013 May 3, 2013 ~ Bernie K.
Blanket-draped yaks hunker down outside a young Kyrgyz couple’s yurt on the eve of a summer trading journey. Made of interlaced poles covered with felt, these portable homes are packed up and reassembled for seasonal migration. Wooden doors are imported to the treeless plateau from lower altitudes. Think of shelters and clothing as art. Some of them are really fine, museum quality art. At that level each is a masterpiece of achievement. The artist –whomever he or she was –stepped up and used their creative imagination and fine skills to produce a functional and beautiful structure or fine piece of clothing. They accomplished that in spite of the fact that they were constrained by the technology and tools of the time and the materials and resources that they had at hand. Most of the materials were local, some were traded for. Each piece — each fine work of art — came into being as a result of their skill and their creativity using the materials they had available. Furthermore, each artist had a deep understanding and respect for the materials they used. Let’s look at some examples from that perspective. 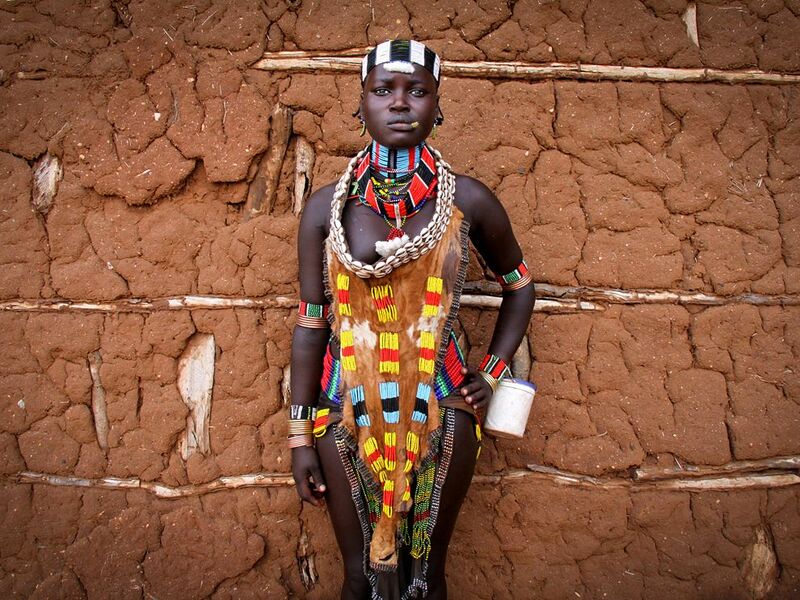 The Hamars are a people of East Africa living in southwestern Ethiopia in a fertile area of the Omo Valley. The gracious Hamar women, freeing pride and dignity even in the midst of the bustling weekly market, are easily spotted with their characteristic outfits. They take pride in their dress and accessories and win the prize as the most decorated of the Omo people. The traditional dress code for unmarried Hamar girls includes elegant cowrie-shell collars, seeded or glass-beaded necklaces, and decorated goatskin clothing. The same is true for the images that beautifully portray the shelters and clothing. They are not just tourist snapshots. They are fine images. In most cases fine photographs, like the photograph of a work of Nature by Ansel Adams, For them we would also like to know things like he name of the photographer and the details about the photograph or image. In that way each shelter or piece of clothing and its image is treated as a work of art and accorded the recognition and the honor they deserve. If the piece was produced using non-local materials, the community had to engage in trade. To do that, as a community they had to produce an excess of the product or products that others wanted and transport them to the buyer’s location. There they could exchange it for something they wanted that the distant suppliers had. The exchange took place at a mutually agreeable rate of exchange, i.e., price. Both parties benefited. Moreover, the exchange made it possible to create the work of art. Clearly, available sources do not provide all information we would like to have. What we will do on the blog in the blog posts that follow, pertaining to clothing and shelter is document each as a work of art as best we can using the available information and giving credit to the sources. This will allow us to honor its creator and that of the image as an accomplished master, one who truly understood his/her craft and was creatively able to produce a masterpiece. It would be treating each piece for what it is, just like the work of a recognized master — like a Noguchi table, an Eames chair, a Frank Lloyd house, or Ansel Adams photograph — even though we may not know the name of the artist, especially in the instances of shelters or clothing designed and built by ancient peoples.